My master’s love of the whiskey led me to learn the art of distilling, if for no other reason than to save him some money and ensure I didn’t starve. Whenever he launched on a drinking binge I might not get paid for weeks. I’m now a master distiller and my wares are sold all over the country. Not legally of course. I have a series of connections with various officers and gentlemen who appreciate my craftsmanship. These days I’m confined a little. I’m a hundred years old. A mishap with the still a few years back, blinded me. Now I know how my master felt. I’m left to direct the family business and spend my time by the fire telling stories of the old days. What can you tell us about what’s happening to you now? A young man from Dublin has sought refuge in our house. He’s a rebel and he’s on the run. Silly fool shot an English officer in the head. What a mess he’s made. That English officer was one of my biggest clients. I’m not quite sure what I’m going to do with young Edward. He reminds me of myself when I was younger, full of righteous resolve to rid the land of the oppressor. The soldiers will be searching for him, that’s for certain, and I don’t want to draw too much attention to myself. The Brigadier already suspects I have rebel tendencies. If Edward is caught in my house there’ll be all hell to pay. I’ll have a drink and consider the situation carefully. What did you think when O’Carolan first mentioned his connection with the Faeries? Hasn’t anyone ever told you it’s impolite to ask too many questions? I’ll indulge you for now but only because your curiosity is somewhat endearing. First of all, don’t ever use the F word when speaking of the Good People. They are a magical and powerful race of beings beyond the understanding of mortal-kind. They bestow blessings and curses as they see fit. So, it’s best not to get on their bad side and they do not like that word. They do not like it at all. When my master first mentioned the Good People had gifted him with the skill of music I thought he was drunk. Later, I thought he must be mad. Then I decided he was a liar. It was some years before I understood he was none of those things. I’ve never felt safe travelling on the open road with only a blind man for company. There’s highwaymen at every turn and you never know when you’ll encounter them. Even so, highwaymen are not the most frightening experience I had. There was the time my master drowned. That was a terrifying thing. What is the worst thing about the English soldiers? Some would say the worst thing about the English is the haughty way they march about as if they own the place. Others might say it’s their frustratingly slow wits. I reckon it’s their music. There’s no melody to it at all and most of it is so melancholy it drives me to distractions. What is the best thing about them? English soldiers drink a lot of whiskey. Their collective thirst has proved very profitable to me and mine. My one true friend in this world is Denis Hempson, the renowned harper, who often sits by my fireside and shares stories with me. For a young man of 93 he has a certain degree of wisdom about him but he’s a notorious whiskey sop so his visits can be quite costly. Even so, I trust no man in this world like I do young Denis. I was his guide back in the days when he was Bonnie Prince Charlie’s personal harper. You might say we’ve been through a lot together. My beloved wife passed on years ago. I’m a hundred years old. I haven’t thought about such things in weeks. Though I’ve noticed my young grand-daughter is giving the eye to this rebel, Edward Sutler. I suppose I’ll have to nip that in the bud. I despise those who take advantage of others. I detest anyone who thinks too highly of themselves. Braggards and thieves of any species are the lowest of the low. That pretty much sums up the current administration and aristocracy of this country. If this attitude defines me as a rebel, then so be it. Whiskey is the ancient beverage of Ireland. It is both a medicine and a great comfort through hard times. I’ve been distilling this pure spirit for more than fifty years. I love a good story, though there’s not many decent storytellers left these days. And nothing makes me happier than a pipe full of Virginia. If you’re patient with me I might be persuaded to tell you something of what Denis and I got up to in Scotland during the uprising. It’s a roaring yarn concerning the fickle nature of politics and the fortunes of war. It will have to be another time, though. I’m not feeling particularly well at the moment. Not many people know this. By a quirk of fate, I enlisted in both sides of the war between Prince Charles Edward Stuart and the English crown. I never intended to. I’m not a traitor. That’s just the way things turned out. Don’t you be telling the soldiers about that. Do you hear? Caiseal Mor is the author of eighteen books, both fiction and non-fiction. He has also written and illustrated two graphic novels and produced seventeen albums of original music. 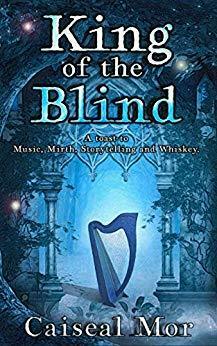 “King of the Blind” was first published as “Carolan’s Concerto” in 1998 by Random House. With “King of the Blind” he has restored some scenes that were cut in the editorial process, re-edited the manuscript and revealed more about Hugh’s mysterious past. He is currently working on a sequel. You can find Hugh on the pages of King of the Blind.